Brown the sausage, add a dash of cayenne pepper and taco seasoning to taste. Brown the potatoes according to package instructions, salt and pepper to taste. Sauté the onions and peppers in olive oil. Scramble the eggs, season with salt and pepper, and then stir in the onions, peppers and mushrooms. Add the sausage, potatoes and black beans and mix together. 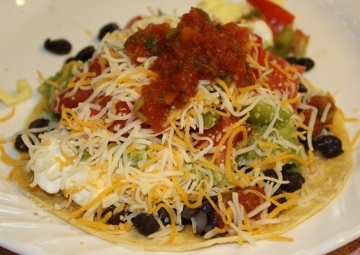 Serve on warm tortilla’s with shredded cheese, sour cream, guacamole, salsa.